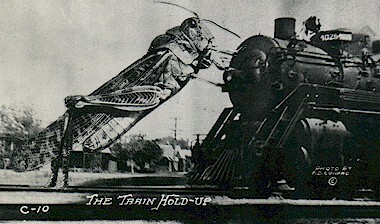 It was not uncommon during the grasshopper plagues to hear that the Grasshoppers stopped trains. Here is an exaggeration postcard from the early 1900's. As cold weather came on, they collected more toward warm spots; wagon roads and railroad tracks, being warmed up during the day by the heat of the sun, were completely covered, and as they seldom move at night, the morning after found them stuff and numb, especially on the iron rails, from which they could not move until the sun warmed them up again. Railroad trains often had difficulty in getting up the grades on account of the wheels and track getting slippery, which gave rise to the story that "Grasshoppers were so thick they stopped the cars." This also happened in Missouri. The Annals of Platte County (Missouri), by Paxton in 1897 told of a report dated, August 21, 1874. The railroads killed so many in places that the rails became so oily from their fat that trains could not run. The cars for about ten days were so much obstructed on the Texas Central line as to necessitate their stopping occasionally to clear the track of the grasshoppers. Grasshoppers and Trains What can we learn from the Grasshopper Plagues?